As you know, I’m dating and not having the best time with it. I’ve tried to maintain a good attitude through it all. At best, the men have not been all that interesting (hint: a bacon-weave meatloaf is not the best conversation starter). At worst, they’ve been jerks and liars (question: when were you going to tell me about your girlfriend?). Some moments can be exciting and fun, while other moments it’s utterly exhausting. I knew one of my lessons in life was to learn to make wiser and better choices in who I gave my time and self to. I had not been very good at that in the past. I met someone recently who was so kind, so respectful, so sweet. He was so nice to me. I had never met anyone like him before. He is a good man. And at first I thought he looked a little like Matthew McConaughey (and not from his Dazed and Confused days)–bonus! I had high hopes. He made me laugh. He was smart. I was looking forward to seeing where this might go as we got to know each other. I was really excited. Then he dumped me, in the nicest way possible. I was stunned. And because he is so nice and genuine, I had no anger to hold on to in order to process this. For those who have not witnessed me in all my glory, me and a bottle of wine in an hour does not pretty make. Why did this hurt so much? Because finding a good match is only part of the picture–this pain wasn’t about him. The possibility of impermanence throws an entirely different layer on the complexity of relationships. It’s the fragility and fickleness of relationships that terrifies me so much. That you really just don’t know if it will last, when it might end. You can hope for the best, work really hard to make it last. Promise and vow and intend to keep it going. But people get dumped all the time. People get divorced. Couples become uncoupled. Not knowing if or when absolutely terrifies me. Two weeks, five years, 20 years, 45 years: you just never know. I’m not down with that. In the past I thought I couldn’t trust myself. I’m learning to. Now, I question if I can trust hope. I know I need to regroup. But I’m not sure how to get there, or even what “there” is. I just know I’m sad and a bit scared. Dazed and confused. This entry was posted in Dating, Relationships and tagged dating, dazed and confused, dumped, fears, hope, relationships, trust. Bookmark the permalink. I ♥ you. I know it’s not the same, but I do. Relationships are like everything else in life, temporary. It’s mind-blowing to think about it sometimes. It’s enough to cause anxiety in many people’s lives, even while they are engaged in a relationship. We fret over the past, worry about the future – we even forget to focus on the present. Even when relationships continue on, they change moment by moment. My spouse and I are not the same people we were when we met. Luckily, we love and enjoy our new selves too. We intend to continue doing so. I remember watching a film once in which the wedding vows contained the word “now” a lot. It was funny, but wise too. I simply try to remember to enjoy all of my relationships “now”. And I know how lucky I am too. I am lucky that I met my love and we’re making a go of it. I’m disappointed to read that the kind man you described so kindly decided the relationship just wasn’t what he wanted. And, yes, it sometimes happens this way. Your response was just so lovely to read. You are loving. You are loved. Your calm, steady presence is always a welcome reprieve. I agree–I have always marveled at how two people can continue to grow in their own separate ways and paces, and continue to adjust just enough to keep the relationship working. It is something I admire and love to witness. I am glad to hear you are one of those I admire. I have never made good relationship choices for many reasons that I now understand. I have made great strides. I continue to work on me, and making the best life possible, for me. When/if life provides someone for me to make a go of it, it will happen. I too am greatly disappointed this one was not. Part of my work is being graceful. I am glad it sounds like my coping with this has been graceful. Thank you always for your support. 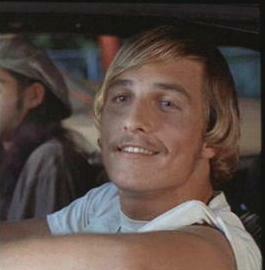 Wooderson: “all right, all right, all right” Love it, thank you. Needed this, thank you. Love you, thank you. Holding on to your words, to trust hope. Unsure. But have put some ice on it. And the wine does help… Gonna repeat your words in my head as a continuous loop…in the hopes of trusting hope again…thank you, friend.